Suspected Roman temporary camp at Easter Powside. This enclosure is known from a number of air photographs (e.g. RCAHMS Neg: A29091) and takes the form of a slightly irregular parallelogram with rounded corners (fig 1A) and photograph (fig 2). The site is located at NO 056245, 1.5 km to the west of the Gask system tower of West Mains of Huntingtower and, despite its name, it lies on the farm of Marlefield. It sits on a low bluff overlooking the tiny River East Pow from the 35m contour and has excellent views in all directions. Its form is at best a distinctly distorted version of the classic Roman military “playing card” shape, but less than regular site plans are far from unusual in temporary works. The design is certainly well suited to the ground on which it stands, since the bluff line projects to the north at the site’s northwest corner and the enclosure ditch simply follows it to take advantage of the most defensible line. The entire ditch circuit has never been visible from the air and the writers have not as yet had time to trace the missing sections, by either trenching or geophysical means. Nevertheless, a reasonable approximation can be interpolated. The enclosure can be shown to have measured c.76 m (n-s) along its western ditch, by c. 69 m (e-w) along the southernside, over the ditches. The eastern ditch does not show in full from the air and the northeast corner has been destroyed by a, now disused, railway track which bisects the site from east to west, but it was probably in the region of 10 m shorter than the western side. 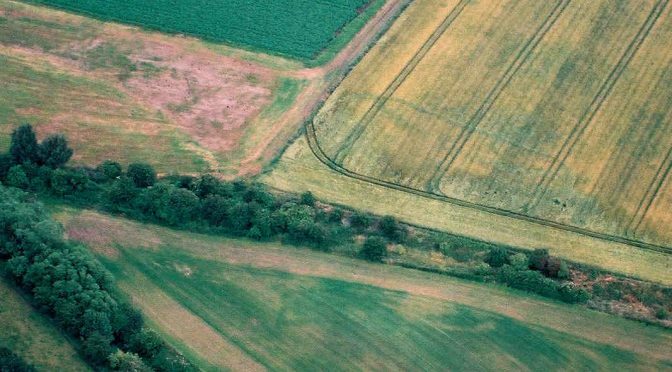 The northwest to southeast diagonal is c. 102 m. In all, the site probably measured c. 0.45 ha (1.12 acres), which would make it one of the smallest Roman camps currently known in Scotland. The only visible entrance break lies in the centre of the north ditch, closest to the river, and there is a short length of ditch just outside it which might represent a titulus defence. This is, though, offset by some 12 m to the west of the entrance centre line and so the identification must remain doubtful until further study can be organised. The excavation consisted of a single ditch section at the enclosure’s south-eastern corner and revealed a standard Roman, military style, V shaped ditch 1.9 m wide and 0.85 m deep, with signs of an “ankle breaker” sump (fig 1B). The ditch had lain open for long enough to silt naturally to almost half its original depth, whereupon the silts (L’6) had reached a reasonably stable angle of rest. 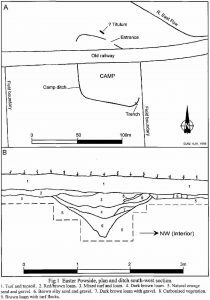 This may represent a considerable period of time, but the ditch had then been backfilled from the direction of the enclosure interior (NW) with a mixture of turf and loams (L’s 3, 4, 8 and 9) which may have derived, at least partially, from an internal rampart. The trench only extended for about 1 m into the interior and so may not have reached the position of any surviving rampart base remains, but no traces of any other internal defence, such as a palisade, were encountered in that area. No finds were recovered, but the ditch shape, the site’s overall morphology, and the possible indications of a turf and earth rampart do seem highly suggestive of a Roman date. 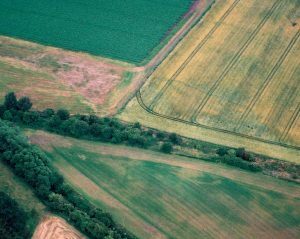 The site does, thus, seem quite likely to be a small temporary camp (albeit this may not yet be regarded as proven), perhaps connected with the building of the Roman road from the Gask Ridge to Bertha, which lies only c. 200 m to the south.